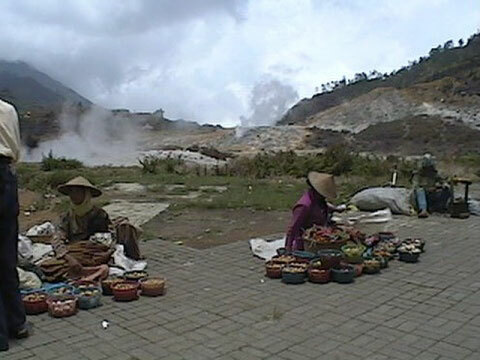 Our first visit to the Dieng Plateau. 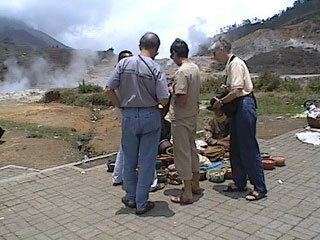 We first visited the Dieng Plateau in central Java October 16, 1999. 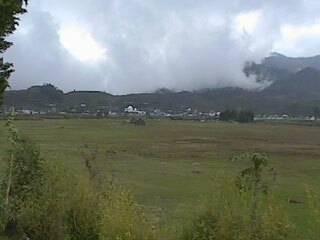 This area northwest of Yogyakarta is in the volcanic mountains and over 2,000 meters elevation. 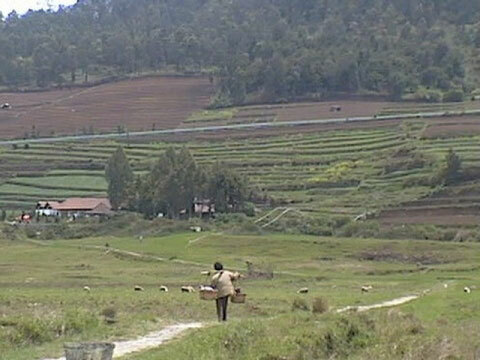 The name "Dieng" means "abode of the gods." There was once a flourishing set of temples here. 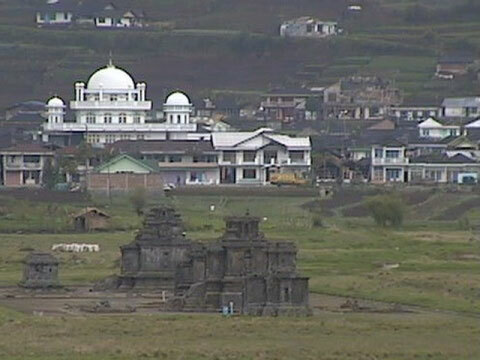 Built in the 8th and 9th centuries, about the same time as Prambanan and Borobudur, the temples were mysteriously abandoned around the turn of the first millennium. 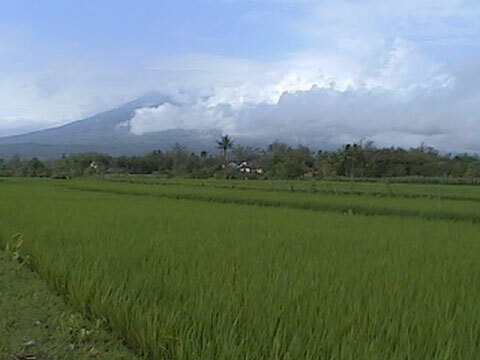 The crop in the picture is beras (rice). The area is very active geologically. 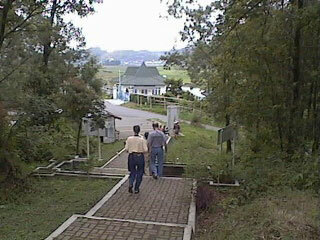 There is a geothermal plant here, and an area that reminds us of Yellowstone. This lake smells strongly of sulphur, and when the light is right is a bright green. 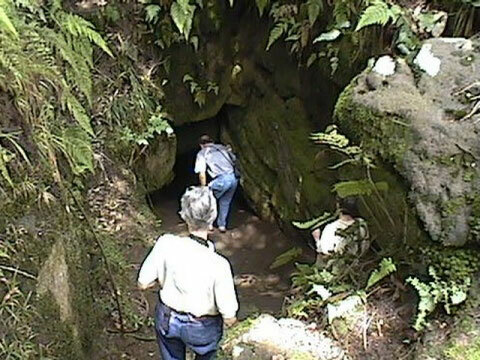 Several "meditation" caves are found near the colorful lake. 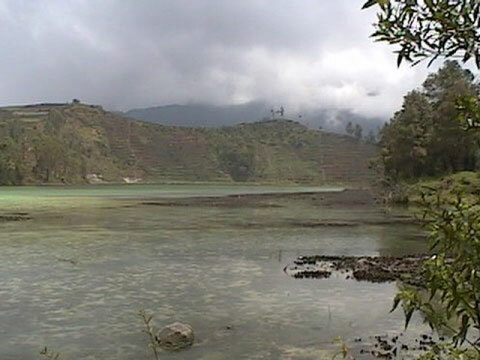 One is said to be where Soeharto met with the Australian government representative to make the deal for annexing East Timor. We were accompanied by Dwight and Kathy King. Dwight, a political science professor here to study the transition to democracy, had to get up-close and personal with the cave. 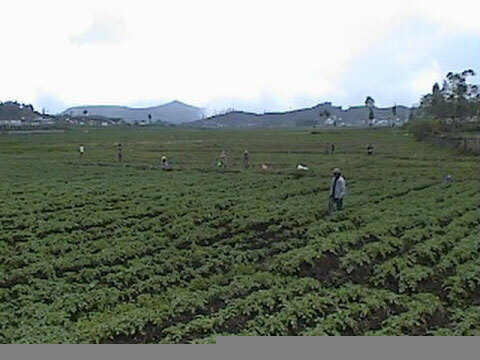 This potato field is large for Indonesia. 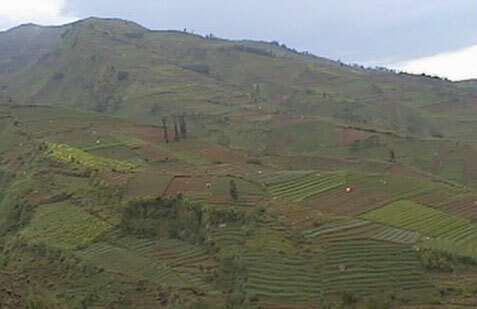 Folks in the high elevations eat a lot of potatoes, but need their rice too. 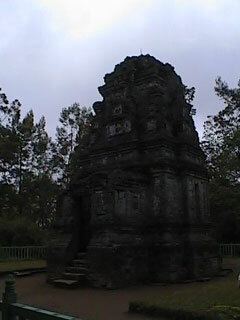 Candi Bima (temple Bima) is one of the few semi-preserved Hindu temples in this area. It is different in that each of the niches has a face looking out. The tourist development is obvious here. We were the only non-Indonesian tourists we saw. 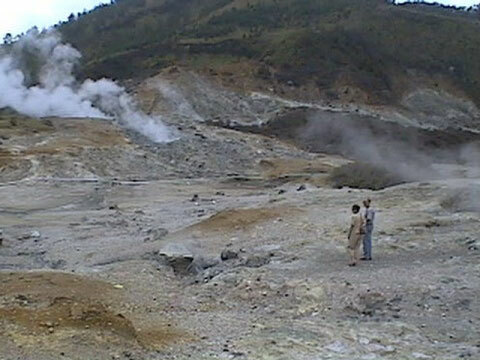 Here we are at Dieng's version of Yellowstone. The hawkers here are selling tiny potatoes, some as small as grapes. We bought some. They were tasty boiled with butter and parsley. 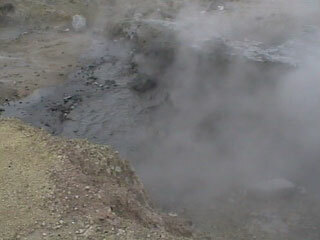 This is a bubbling pot of black mud. Pretty impressive. Even more impressive in that there are no paths marked or fences. The guidebook says to be careful not to break through the crust since the water beneath is boiling. It doesn't describe how one identifies thin crust. Dwight and Kathy in "Yellowstone without fences." 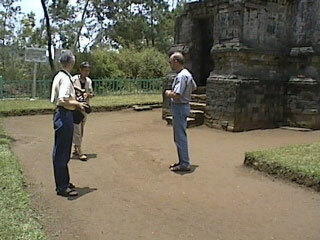 A large pasture area with temple ruins and folks tending sheep. Zooming in on the town with its mosque. Indonesia is a good place to see religious syncretism in action having been animist, then Hindu and Buddhist, then experiencing the coming of Islam and Christianity. You find people doing traditional things relating to any of them. This picture could have been taken centuries ago, if you leave out the geothermal pipeline and the white pvc pipes used for water systems. Several hawkers were making and selling these little candlestick/vase things from a type of wood which has a distinctive grain. They peel a stick and there's the pattern. The wood is very soft and wet so a chisel easily makes a hole. We have a vase and two candlesticks. 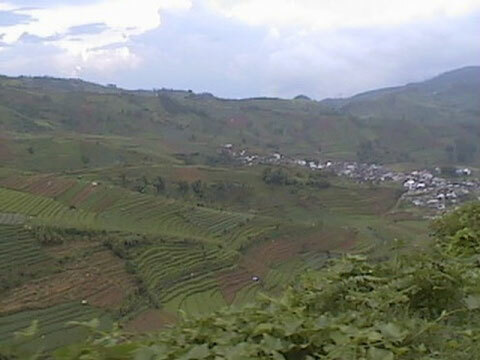 The amazing terraces of central Java. 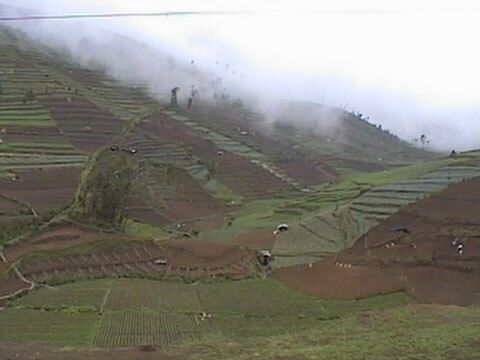 Entire mountains are terraced. Of course that means you have to climb a mountain to work your field. The people we saw coming home from those fields looked exhausted. Kids playing soccer at the village school. The roofs here are tin painted black instead of the usual red clay tile. Potatoes dug up right by the road. 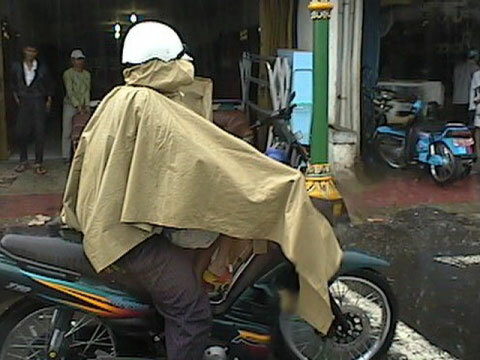 Standard family transportation in central Java is a small motorcycle. 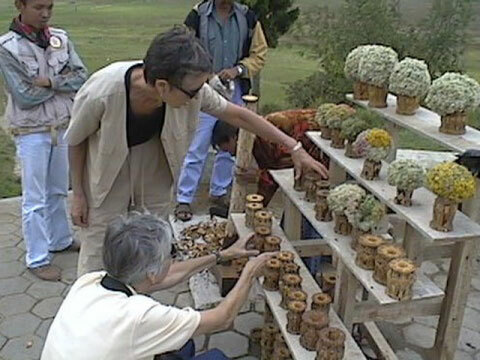 We have been wondering what people do when the rains come. Well, it rained like crazy. Notice the child in front of the driver. A wall painting outside the restaurant where we ate lunch. The rain was pretty dramatic. [an error occurred while processing this directive] visitors since October 17, 1999. 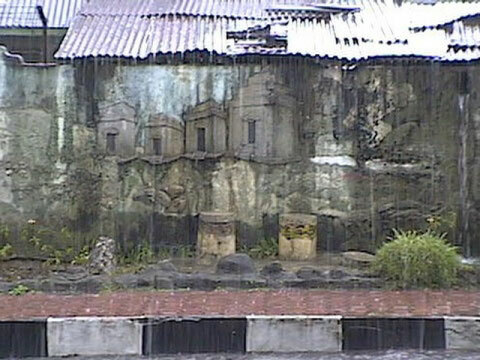 Back to main Indonesia images page.